Millennium Tower is a gorgeous, sculptured-glass edifice designed to reflect the many different lights around San Francisco Bay as it rises above the Frisco skyline. The 60-story tower has become the symbol of residential extravagance in the Bay Area. Mediaboom has extensive experience marketing for real estate developers like Millennium Partners. We worked with Millennium Partners to create an immaculate interactive website that captured the stunning beauty and quality of the residences at Millennium Tower located in the heart of San Francisco. In 2007, Millennium Partners wanted to introduce San Francisco’s fourth-tallest building, Millennium Tower. Millennium Partners needed a web presence that would capture the same sense of beauty and luxury as the Tower’s stunning sculptured-glass façade, which reflects the lights and colors of San Francisco Bay. The 60-story tower is a distinctive addition to the Frisco skyline, and has quickly become a symbol of a sumptuous lifestyle in the Bay Area. The website needed to serve both potential and current residents. Mediaboom designed and developed an interactive website showcasing the beauty both inside and out of the building and an interactive map of the neighborhood. Recently, Mediaboom developed a new iteration of the website, which now features virtual tours of the building and soaring aerial flyovers. 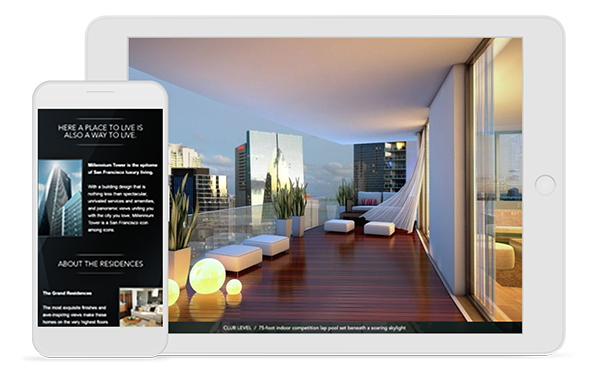 In addition to the Millennium Tower website, Mediaboom was tasked with the challenge to develop LA VIE, a website and mobile application with a built-in social network exclusive to Millennium Tower residents. “La Vie” announces exclusive life experiences designed around shared passions for food, wine, travel, art and culture. Mediaboom developed the LA VIE website, which gives residents VIP access to a wide range of events including entertainment, fitness and dining experiences. The LA VIE app, also developed by Mediaboom, features news articles and periodic updates throughout the year, regarding everything Millennium Tower residents need to know to stay informed about events happening inside and outside the tower. Mediaboom also built a social networking site similar to Facebook, which allows owners to connect online, share experiences, and discover the latest private events that Millennium Tower has to offer. Mediaboom was hired to design Current — a customer relationship management system that helps the Millennium Tower sales team track and send targeted communications to potential residents. The design had to be quick and easy-to-use with an intuitive navigation and layout. Mediaboom designed a user-friendly dashboard interface for the admins of the tool. Using customized filters and color-coded client status indicators. Agents could find, add, and edit client information and requests. The functionality is presented with a sleek, modern feel.